It's really scarey how fast the end of year is approaching. But the Festive Season is a great time for family and friends to gather. If you want somewhere really special to host your next party then the gallery on Level 4 at The Hilton is really perfect. With heaps of room, lots of wonderful art to look at, not to mention outstanding views. In the evening the sunset looking out across the bay is just beautiful. The way the gallery is setup hosting a small intimate cocktail party or a gathering for up to 200 people is possible. With affordable rates and catering that can be organized thru the kitchen at The Hilton, it's well worth considering. Feel free to drop by or contact the Gallery Manager Lukas directly on 0419 560 146 to discuss your needs. NEED SPACE FOR YOUR NEXT FUNCTION? 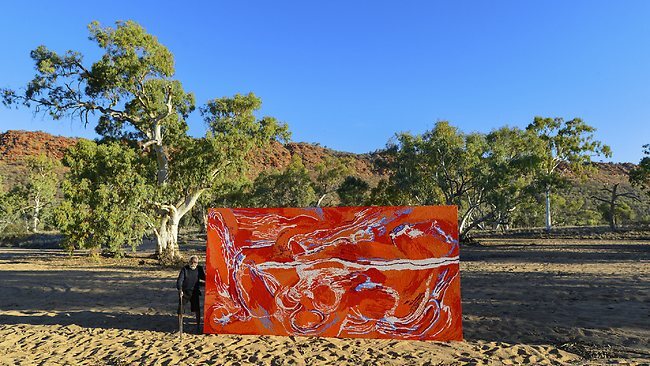 RED DESERT DREAMINGS GALLERY is located on Level 4 of THE HILTON, SOUTH WHARF on the Yarra's edge in Melbourne's newest dining , shopping and entertainment precinct. This great space with its beautiful array of fine Aboriginal Art is available for day or night-time hire for private functions at modest room hire rates. The gallery is suitable for small, intimate gatherings to cocktail parties for up to 200 people. Catering to suit your requirements can be provided by THE HILTON. Use the link below or to register interest including function date, time and number of guests. Otherwise contact Gallery Manager Lukas directly on 0419 560 146 or at lukas@reddesertdreamings.com.au to discuss your needs or arrange an inspection and quotation. Aboriginal families and groups have different names for the areas of country where they have lived for generations, they do not go by the State names as we know it. Aboriginal people also go by the name of that area where they and their families have lived. If we go by each State as we know it, the equivalent area would also stretch beyond those boundaries. Aboriginal people also will refer to themselves and their families by the areas of country that they have lived in for generations. It's a great time to purchase Aboriginal art ... Red Desert Dreamings Gallery is offering a lot of fantastic paintings at a considerable discount. If you have a chance visit the gallery at level 4 at the Hilton Hotel at South Wharf. There is a huge selection of Paddy Fordhams on display and if you're a fan of this artist then a visit to view his works will not disappoint. Paddy's works depict the good spirits and the protector spirits. He was there during World War 1 there are paintings on display that show the aeroplanes landing during the war, the coming of white man to his community and the various tools and animals that were an important part of this artists' life. The vast selection of paintings ON SPECIAL represent works from many artists, so if you don't find something that suits your needs, please ask, we're always interested to hear from you and will try and find a painting that fits your design and budget requirements.